These Thick and Chewy M&M Sugar Cookies are so easy to make and they are one of our all time favorites! 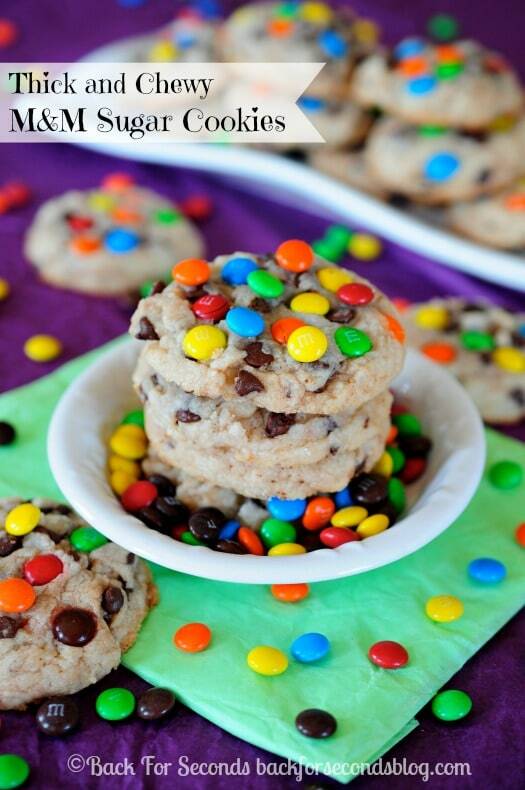 I shared these M&M cookies with you last year, and they are crazy good – but that recipe yields a flatter cookie. It all depends what you are in the mood for. I have a thing for thick, chewy cookies. They are the best! 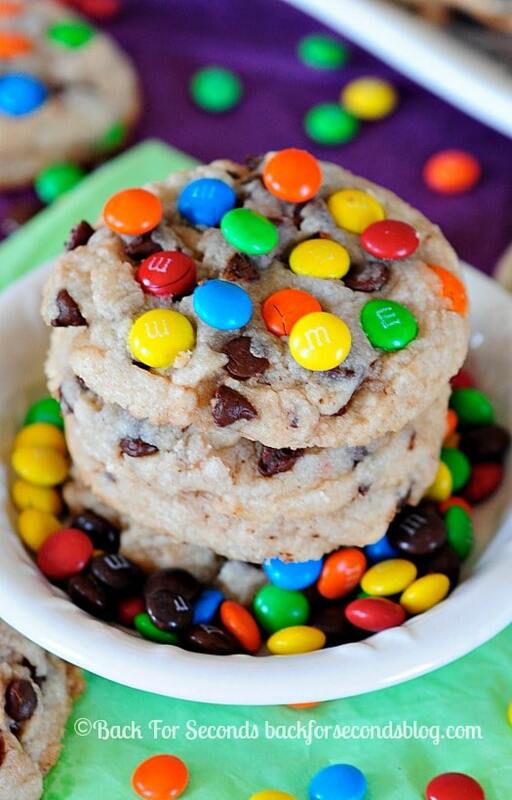 So I knew I had to create an m&m cookie that was soft, thick , and perfectly chewy. These are by far one of my family’s new favorites! My husband came home from work the day after I made these and headed straight for the cookie jar. He told me he couldn’t stop thinking about them all day long! I’d say that’s a sign of a good cookie! 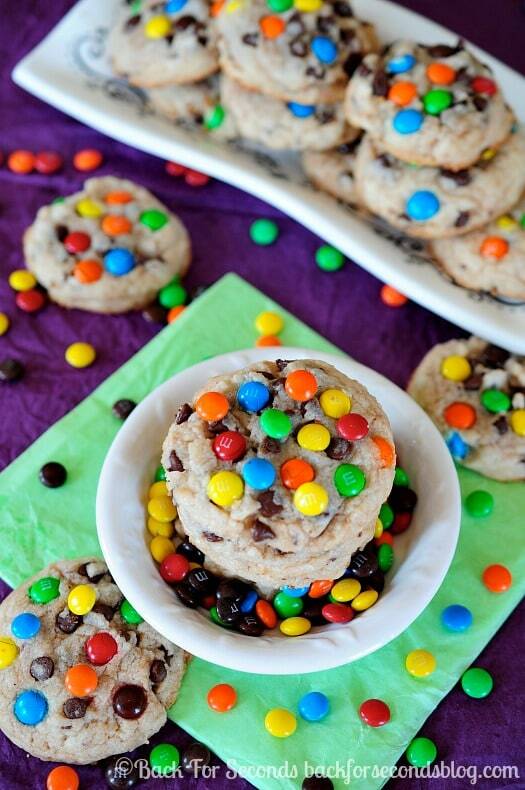 There is just something magical about buttery soft sugar cookie dough studded with chocolate chips and colorful M&M candies. No one can resist these! These are such pretty and colorful cookies! Perfect for kids! I love all the colors in these cookies and the cream cheese addition is wonderful! So in your cookie recipe when you say “heaping tablespoons” can you explain how much dough exactly you’re using? Is it like 1 Tbs cookie scoop or 2 TBS or what? It’ll help with baking time; knowing exactly how many tablespoons you are using of Dough. Please please! 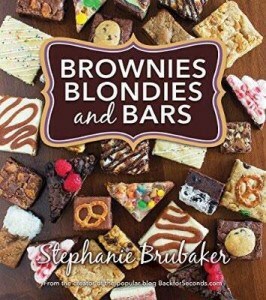 Thank you:) you’re recipes are fabulous! Thank you so much for taking the time to respond so quickly! I did make them and they were thoroughly enjoyed! However, my very picky husband (who hates “milky” tasting things like sour cream and milk but at the same time loves cheesecake…?) could taste the cream cheese in some of the cookies more than others…I baked some right off the bat when I made the dough and those he didn’t taste any “milky” flavor. But then when I let the dough chill in the fridge he said those he could taste more cream cheese? Have you experienced this at all? Do you refrigerate this dough before baking or do you bake instantly? And lastly do you think I could not melt the butter to see if the dough wouldn’t be so thin when not chilled? Or did you get better results with melted butter?